Next you will need to prep all your vegetables and place them into a large mixing bowls. 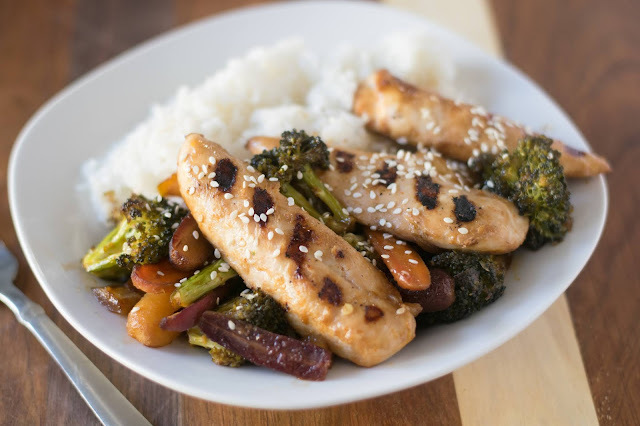 In a separate bowl you will combine the soy sauce, oil, sesame oil, brown sugar, garlic, and ginger. Give everything a toss so that it is full coated int he sauce. Now place the chicken down the center of the baking sheet. Place the vegetables on either side of the chicken. Place the baking sheet into the preheated oven for 25-30 minutes. And there you have it! 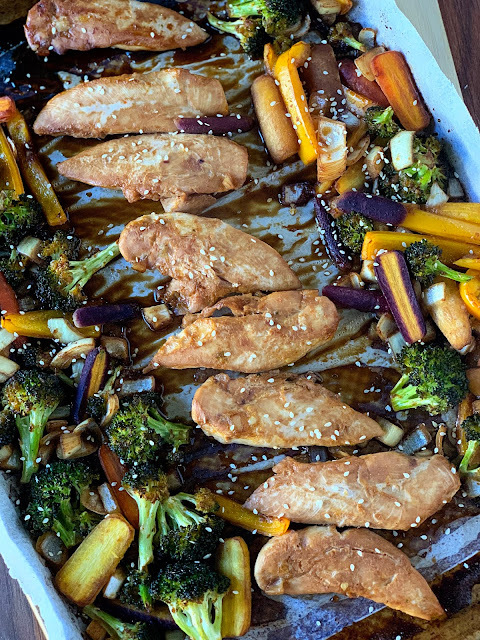 A gorgeous chicken dinner ready to go! Not gonna lie, I threw this on my grill pan for this picture because I thought it looked pretty. lol BUT...I made some rice in my instant pot real quick and this was a perfect better than takeout meal! 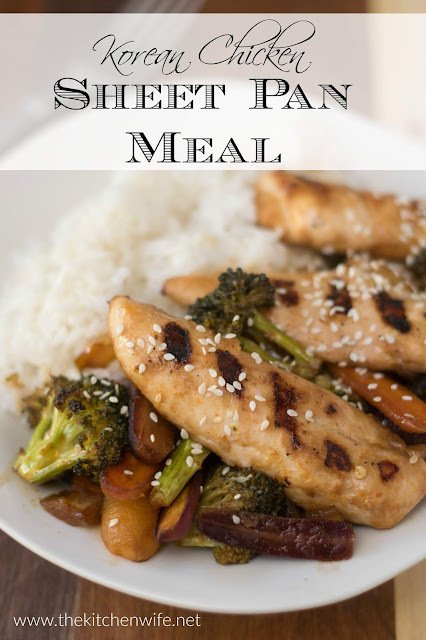 I know you are going to love it so get in the kitchen and give it a try TONIGHT! 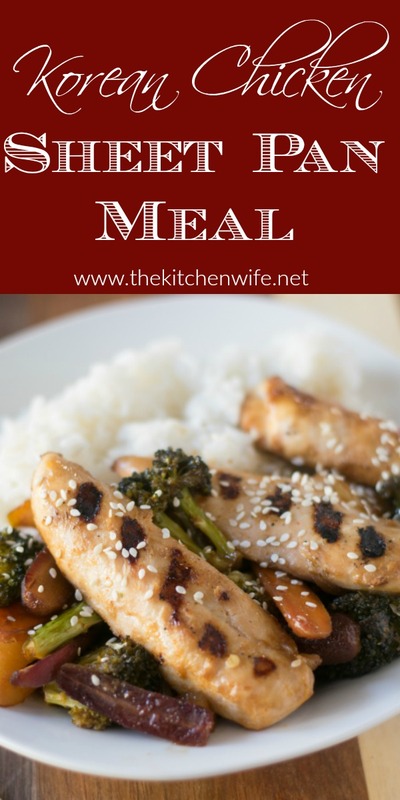 It doesn't get any easier than a sheet pan meal and this Korean Chicken one will NOT disappoint! Prep the vegetables and place into a LARGE mixing bow. Add the chicken to the mixing bowl. In a separate bowl combine the soy sauce, oil, sesame oil, brown sugar, garlic, ginger, and sriracha. Whisk until smooth. Pour the sauce over the chicken and vegetables and toss until everything is evenly coated. Place the chicken down the center of the baking sheet. Place the vegetables on either side. Place in the preheated oven and bake for 25-30 minutes.